Fig. 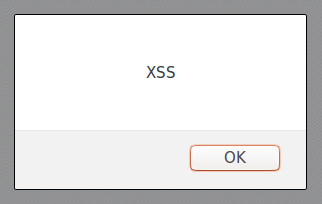 1 – A classic XSS popup. Cross-site scripting (XSS) is both the name of the most common vulnerability in web applications and the exploitation method performed against it. XSS attacks abuse the dynamic way websites interact with their clients, the browsers. It makes possible, for an attacker, to control the victim’s browser and his/her interaction with a given vulnerable website. To display back content provided or controlled by an user, like an URL parameter or an input field, a flawed application opens the door to manipulation of this content. This manipulation, generically called injection, is the XSS attack. Cross-site scripting can occur in the context of an application or not. Out of the context of an application is very rare but more dangerous and it will not be covered here. Focusing on the application, XSS can be caused by server side code (code sent by web server) or client side code (code processed by browser from code sent by web server). So we have source-based and DOM-based types of XSS in a context of an application. Both have the following execution types. Fig. 2 – Example of parameter value reflection. Fig. 3 – The XSS being triggered. When the website or application stores user input in a database or a file to display it later, like a field in a profile or a comment in a forum, the resulting attack is called persistent or stored XSS. Every user that sees this stored content is a potential victim. While in this last attack, an user just needs to open or navigate to an infected page to be attacked, in the reflected one an user usually must click on attacker’s link, which contains what we call vector or payload, the code used for the XSS attack. Although seeming less dangerous than stored version, a reflected XSS can also be invisibly embedded into any other website and executes from another browser tab or window in the context of the target application. Usually, for a proof of concept (PoC) of an XSS attack exploring source-based flaws, security testers use one the following code. These are just to prove the vulnerability; for attacks in the wild, a victim of an XSS attack usually will not be able to see anything while his/her browser will perform the attacker’s desired actions. 2. What Can be Done With XSS? These are the main actions that can be performed by an attacker when exploiting an XSS flaw. If a victim is an administrator of a Content Management System (CMS) like the open-source WordPress, it’s possible to completely takeover the website like demonstrated here. As long as the attacker knows how to perform actions that victim can do by means of HTTP requests, it’s possible to change victim’s recovery email if there’s no password protection leading to account takeover. Browsers use a small text file to store locally important data about a given website. This file contains what we call cookies, pairs of variable and value that have some meaning for the application that sent them to browser. Cookies are used to identify a person after he logged into an application, so server has no need to ask for credentials again every time an user request a resource. While cookies are valid (they expire after a certain time), an user session is active in the application. If these valid cookies are stolen, the thief can impersonate that user and interact with application in the same way the real user does, without even knowing his password. This gives access to all personal data stored about an user, like his telephone number, home address and even his/her credit card details in an e-commerce website, for example. For website administrators (admins), an XSS attack can lead to takeover of his/her website and even the machine where it is hosted. Where HOST is a domain or IP address controlled by attacker. By being able to capture what an user types in form fields, like the ones for login (username and password), an attacker can also compromise an user account in a given website. Users can be tricked into thinking that visited website was hacked or it’s not functional, which can lead to panic or the impossibility to perform actions in the application like buying an item. Where HOST is a domain or IP address controlled by attacker and IMAGE is a full screen image with a “Hacked by” message, for example. With the ability to serve any content, an attacker can convince an user to enter or reenter his/her credentials in the application, but this time sending them to an attacker. Very rare use, but possible. An attacker may want to keep away a certain rival in an auction, for example, by making his/her browser unresponsive. It’s straightforward to make user’s browser download any file with XSS, but not necessarily executing it, which would give access to user machine. Unfortunately, due to the fact that an attacker has control over several other aspects of the trusted website, seems not so difficult to also trick the user into open it. Where HOST is a domain or IP address controlled by attacker, FILE is the file attacker want the victim to download and FILENAME is the name of the file in victim’s machine (user can be forced to download an executable file while saving it as an image, for example). Again, with the aim to takeover the user machine, an attacker can redirect the browser invisibly to another web address where another prepared application will try to break the browser barrier to access the user operating system (which would lead to compromise). If user has an outdated or vulnerable browser, attacker has great chances of success. Where is a domain or IP address controlled by attacker.